Human communication is a constant, continuous, and dynamic phenomenon. You cannot not-communicate nor can you un-communicate. For an individual entity, there is only ONE communication. Not multiple, not varieties, only one. That one communication is the culmination of all that has been communicated by the entity until the "now" in time. You cannot go back and un-communicate something. You can only begin from the "now" to create the intended outcome. That outcome is always a negotiation with the receiver/audience/community to cultivate an agreed understanding. TheCapitol.Net has delivered custom, on-site training for numerous clients. For more information about bringing training to your organization, contact us for details: 202-678-1600, ext. 112. America was founded by a public relations campaign. Certainly General George Washington's army played an important role as well in freeing the colonies from British tyranny. But it was Thomas Paine's pen, through his pamphlet Common Sense, which motivated thousands of colonists to join the rebel army to fight for the cause of liberty against their British cousins. It's strange to think that public relations existed two hundred years ago, yet Common Sense was the first mass media campaign on American soil. In a nation of three million, more than 500,000 copies of the forty-page pamphlet were printed. That would be the modern-day equivalent today of about half of all voters watching the same thirty-minute documentary calling on them to overthrow their government—and most of them supporting the idea. From cave drawings to the printing press to the Internet, leaders and their acolytes throughout human history have combined persuasive ideas and available technology to communicate those ideas to those they wish to influence. In a democratic context, the process takes on larger meaning, as the goals of the persuader are often intended to better the human condition, right a social wrong, or protect an unsuspecting public from some menace. We think of public relations as a craft invented in the twentieth century by people like Edward Bernays, sometimes called the "Father of Public Relations." The writings and tactics of this first great thinker and practitioner in the industry redefined both government and corporate communications in America. Bernays (who was also the nephew of Sigmund Freud) defined the topography of our profession through his concept of "engineering consent," and the fundamental tools of press releases and photo opportunities that he perfected are still staples today. Yet whether we use pen, pamphlet and horseback, or web site and satellite to carry the message, the basic principles remain the same. The great journalist Walter Lippmann said the question his communications profession faced was "what to say and how to say it." Communicators using public relations face the same question, but must add a twist: "to what end?" In public affairs, our objective must have some purpose, because the results of our work can have significant consequences. Through the communication of certain facts and how they are presented, people will vote for a candidate, contribute to a nonprofit, join an organization, or take up arms against their government. This book is for those who are seeking the most effective means to communicate on behalf of a government agency, a national association or nonprofit, or an elected official. It will help you channel your hot passion with the cool guidance that has been gleaned through others' experience. The author professes no unique insight into media relations in public affairs. Rather, this book is an amalgamation of the collective wisdom of hundreds of public relations professionals in the worlds of government and politics. It is an overview of the ideas that have become the accepted rules of communications in Washington, presented in one volume. In the world of public affairs, the "viability" of the cause often has greater meaning to us and to others than those causes in related public relations fields. We are not selling soap--we're selling ideas to improve the world. We promote a member of Congress who wants to cut taxes; a nonprofit executive who wants to stop a timber company from clearing a thousand-year-old forest; an association executive trying to build a coalition to lobby against federal regulations; or a federal agency trying to convince an industry that those same regulations might save lives and property. The public relations profession in Washington is often derided as populated by nefarious characters, willing to say anything to promote their agenda. Like most caricatures of Washington politics, this is exaggerated and largely inaccurate. We may not be the direct descendants of Thomas Paine, but our lineage is closely connected. We mostly advance our employer's objectives because we believe in their causes; we share their faith that our goals are just and their achievement will make things better . . . if only a little bit. We like the idea that we can make a difference. To do that, you have to know how. This book is a tool in that undertaking. 2.24 Teleconferences and "Telephone Town Halls"
5.10 The Growing Partisanship of "News"
6.20 The Little Web Site that Could . 6.42 Think before Hitting "Enter"
Bradford Fitch (Author) is President of the Congressional Management Foundation. Previously Fitch was Vice President, Client Services for CQ-Roll Call Group, former CEO of Knowlegis, and former Deputy Director of the Congressional Management Foundation (CMF). He is the author of Media Relations Handbook for Agencies, Associations, Nonprofits and Congress (TheCapitol.Net) and Citizen's Handbook to Influencing Elected Officials (TheCapitol.Net). Fitch has spent 20 years in Washington as a journalist, congressional aide, consultant, college instructor, and writer/researcher. Fitch began his career in communications at age 14, reading statistical summaries of high school basketball games for his hometown radio station in upstate New York. After working as a radio and television reporter in the mid-1980's, Fitch began working on Capitol Hill in 1988. During his 13 years on Capitol Hill, he served in a variety of positions for four Members of Congress, including: press secretary for a House Member, campaign manager for a House Member, communications director for a House committee, communications director for a U.S. Senator, legislative director for a House Member, and chief of staff for a freshman House Member. Jack Holt (Editor) is a recognized leader in successfully formulating, implementing and managing communication programs for very large organizations including both the Department of Defense and the U.S. Federal Government. He created, developed, and produced the DoD Bloggers Roundtable and DoDLive web communication concept, co-authored the OSD policy memorandum DTM 09-026 for the Responsible and Effective Use of Internet-based Capabilities, and is co-founder of the DoD All Services Social Media Council. Jack has more than 20 years communication policy development and application experience, teaches at the graduate level, consults, and collaborates on how to effectively use the new and emerging media in meeting business needs including improving customer relationships, implementing change management and developing innovative organizational environments. He has his own communication consulting firm, is the Director for Policy Analysis for Blue Ridge Information Systems, adjunct lecturer at Georgetown University, and a member of TheCapitol.Net's faculty. He also teaches at the NATO School and has taught sessions on Communication, Journalism and New Media strategies and tactics at the Defense Information School and the Naval Post Graduate School. He is also a member of the PRSA Counselors to Higher Education Committee and the 2009 Chair for the PRSA National Capital Region Public Affairs and Government Committee. Have a suggestion for the Media Relations Handbook? If you have a suggestion for a change or addition to a future edition of the Media Relations Handbook, please contact us or complete our online suggestion form. Find Media Relations Handbook in a library near you. "[T]his book will be of value to students and professionals of political communications and public relations. Summing up: Recommended. Upper-division undergraduate through professional collections." "Although targeted for new media relations staff or ones starting a new press office, even the most experienced public information officer can learn from this book." "Want to become a media relations ace? Here's expert advice. The book is loaded with tips for corporate communicators as well. Impact recommends it highly." "The 'bible' of media relations and a must for anyone charged with the responsibility of successfully dealing with (and utilizing) the media for their agency, group, or cause." "Offers a wealth of practical advice on public relations that will be of benefit to governmental and non-governmental organizations alike." "Great advice for beginners and experienced media hands. If you are a media relations professional--either beginner or seasoned veteran--this is the book for you. Brad Fitch, who spent many years fielding reporters' tough questions on Capitol Hill, has written a timely, practical guide to handling media relations that is filled with solid professional advice. What goes into a press release? How do you develop a strategic message? You've got a digital camera and a fax machine, but what else does your office need to effectively handle the media? Before you start talking to a reporter, do you know the difference between 'on the record,' 'off the record,' and 'background'? When there's an immediate crisis in your organization, what are the eight mistakes that you absolutely must avoid? How do you handle your paranoid boss when he or she has to confront the press? You'll find the answers to these and many other everyday problems in this book. Fitch also gives valuable advice on how to set up an effective website and how to use e-mail for optimum communications. Excellent book for professionals who work in federal or state agencies, trade associations, non-profits, state legislatures or Congress. It's the only handbook you'll ever need." "Provides valuable advice for those who flack for a living." "A superb blend of theory and practice, written by someone who uses words like Gallup uses polls." "Uncertain how to interest the press in your pressing issue? Having difficulty preparing your media-unfriendly boss for a tough interview? Worried about the next communications crisis and how to handle it? Brad Fitch answers those questions and many more in this crisp, clear and completely useful book." 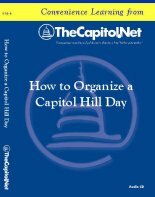 "A seminar from TheCapitol.Net is one of the best ways to learn from the experts about how Washington really works. Now all that insight and information has been packed into this invaluable volume. I suggest you read it, and become your own expert." "Brad Fitch has performed an admirable public service by giving public relations students and professionals alike an indispensable tool. His book provides a road map on both the practicalities and principles of PR, and he shows that honest PR is not an oxymoron. Now it's up to all of us in the media and spin industries to keep our end of the bargain." "This volume is an invaluable road map to the mean streets of a city where information is power and power is everything. Brad Fitch has written a rich 'how-to' lesson for pros and for novices who must negotiate the competitive landscape of America's new media." 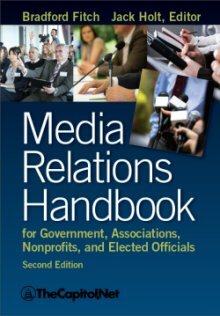 "Media Relations Handbook is to political campaigns what The Art of War is to military campaigns: an essential strategic reference that winners should never be without." "In the Media Relations Handbook, author Brad Fitch effectively presents practical ideas and tips on how to properly conduct media relations. ... The book is a comprehensive and recommended read for anyone interested in learning more about public relations and how people and organizations should conduct their relationships with the media."